Local teenager Elemoni Moana couldn't stop grinning as he accepted his Youth Into Industry award from Whangarei Mayor Morris Cutforth. The 18-year-old Whangarei Boys' High School student and peers Aidan Geard and Cameron Shayler received their Level 1 Basic Traffic Controller certificates at last week's Youth Into Industry awards. The training programme -- conceived by Alistair 'Doug the Digger' McIntyre and Whangarei police Senior Constable Craig Kennedy -- operated as a gateway experience with the students spending one school day a week working in different industries alongside top- quality instructors. While Mr Moana wasn't overly enthused by the mound of paperwork involved in getting the qualification, his face lit up when he spoke about the machinery he got to use. "I operated the digger, the loader, heaps of different machinery -- it was my favourite bit and now I feel great having the certificate too," he said. Mr Moana worked on a truck stop in Raumanga, dealing mostly with warrants of fitness. He joined the other boys in helping David Muir from Whangarei Quarry Gardens create a new carpark in the area as well as other small scale projects. "I think what I learnt will help me become a mechanic which is what I really want to be when I finish school," Mr Moana said. Mr Muir was proud of what the boys had achieved: "they're winners -- absolute winners," he said. 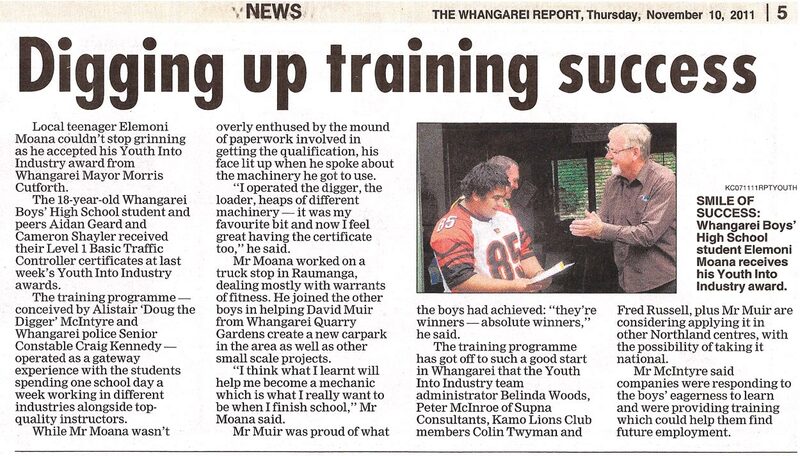 The training programme has got off to such a good start in Whangarei that the Youth Into Industry team administrator Belinda Woods, Peter Mclnroe of Supna Consultants, Kamo Lions Club members Colin Twyman and Fred Russell, plus Mr Muir are considering applying it in other Northland centres, with the possibility of taking it national. Mr McIntyre said companies were responding to the boys' eagerness to learn and were providing training which could help them find future employment.